Hong Kong’s households will have to shell out around HK$33 to HK$51 a month to dispose of their rubbish when a long-awaited quantity-based charging scheme designed to change behaviour and reduce waste comes into force in two years. Environment minister Wong Kam-sing said on Monday that charges for municipal solid waste – rubbish generated from homes, offices, factories and restaurants, a third of which comes from kitchens – would be imposed on all sectors in one go for the sake of fairness and in line with the “polluter pays” principle. Residential buildings, village houses and street-level shops that use government refuse collection services will be required to buy one of nine types of rubbish bags of varying size, priced at an average 11 cents per litre. The charge will be 30 cents for the smallest, 3-litre bag, while the biggest 100-litre bag will cost HK$11. 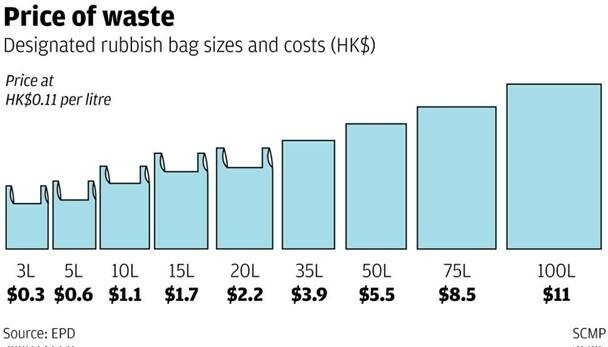 A three-person household opting for the standard 15-litre bag – roughly the same size as a supermarket plastic bag – will pay about HK$1.70 a time, running a tab of about HK$51 per month. It will cost HK$1.10,or HK$33 per month, for 10-litre bags. Oversized items that cannot fit into any of the nine designated bags must be tagged with a label that costs HK$11 for disposal. Sold in packs of 10, the bags will be available at 4,000 sales points, including convenience stores, post offices, petrol stations and special vending machines. Commercial and industrial buildings using private collection services will pay a landfill “gate fee”, based on the weight of the rubbish they produce. The tip fees will be set between HK$365 and HK$395 per tonne. Details of the charging scheme were revealed by the Environmental Protection Department on Monday after years of public engagement. A bill will be tabled at the Legislative Council before the summer and, following its passage, the public will be given 12 to 18 months to prepare for the charging scheme. Full implementation is expected in the second half of 2019. The average Hongkonger throws out about 1.39kg of household waste per day. A target was set in 2014 to slash that figure by 40 per cent by 2022. Wong said the city’s municipal solid waste had increased by over 80 per cent over the past 30 years, far outpacing the population growth of 34 per cent. He said the government would step up enforcement at refuse collection stations and bin sites. Legislation could also empower public officers to carry out enforcement and spot checks within common areas of private residential estates. Fixed penalties for non-compliance have been set at HK$1,500. Wong said the charges – which will be in place for three years – were “acceptable” and in line with practices in Taipei City and Seoul, both of which have seen significant waste reduction since levies were introduced. World Green Organisation policy advocacy manager Angus Wong Chun-yin welcomed the scheme but said the departments involved would need to be clearer about how to divide labour and monitor and carry out enforcement in estates. “It still seems a bit clumsy,” he said. Greeners Action executive director Angus Ho Hon-wai said the charging scheme’s impact would be greater if rates were set higher. “At this rate, I believe it will be difficult for the government to meet the 2022 waste targets,” he said. He said the government also needed to consider how property management companies of commercial buildings will divide tip fee costs equitably among tenants. Rarely has an organisation performed as miserably, every year, as the Environmental Protection Department in its waste management programme. Its failure was highlighted in reports by the Audit Commission and the Legislative Council’s Public Accounts Committee last year. Predictably, the department’s latest waste management report, for 2015, is no different. Its two major targets have moved in the wrong direction five years in a row – the amount of waste per person disposed daily increased, while the waste recovery rate decreased. From 2014 to 2015, waste disposed went up (from 1.35 to 1.39kg), while waste recovered went down (from 36.5 to 35.4 per cent). That’s the worst performance in a decade. In the Environment Bureau’s waste-management blueprint issued in 2013, the objective for the amount of waste per person disposed daily was set at 1kg by 2017 and 0.8kg by 2022. The recovery rate was to be 55 per cent by 2022. Secretary for the Environment Wong Kam-sing has talked up the blueprint for the past two years. But at a January 17 press conference, he was mum about waste management performance, except for an 8 per cent decrease in food waste, which is just 30 per cent of total domestic waste. I have long argued that the blueprint’s waste disposal and recovery targets are unattainable. Wong and his department seem incapable of grasping the simple equation governing waste management: waste disposed is equal to waste generated less waste recovered. Imposing a waste-charging scheme cannot lower significantly the amount of waste disposed, unless there’s a commensurate increase in the amount of waste recovered. And the waste recovery rate cannot increase much without waste separation at source. Wong cited the success of South Korea and Taipei in reducing waste disposed by imposing waste charging. He omitted the crucial factor in their success: waste separation at source is required by law. Waste-recovery companies in Hong Kong have to sell paper, plastic and metal to the mainland at market prices, which cannot be controlled by the Environment Bureau. This means the current 36 per cent waste recovery rate cannot realistically increase to 55 per cent, which is the rate achieved by countries that successfully manage their waste. At its 36 per cent waste recovery rate, Hong Kong needs to reduce waste generation by 40 per cent from the current level to achieve the 0.8kg average amount of waste per person disposed daily by 2022. In their dreams. A long-awaited “producer pays” levy fee covering certain waste electrical and electronic equipment is likely to range between HK$15 and HK$165, according to a government paper. Once fully implemented, manufacturers and importers will have to be registered and must bear the costs of properly recycling the items. The proposed charges are HK$15 per item for computers, printers and scanners, HK$45 for monitors, HK$125 for washing machines and air-conditioning units, and HK$165 for television sets and refrigerators. They must be paid to the government on a quarterly basis. Appliance sellers are also required to collect old appliances upon request from purchasers of new ones and deliver them to a licensed recycler for free. Environmental Protection Department assistant director Samson Lai said the charges recovered the full costs of recycling and the scheme could be reviewed when appropriate. But he admitted that some retailers might try to pass some of the costs to consumers. About 70,000 tonnes of e-waste is disposed of in the city each year, 80 per cent of which is exported and the rest usually landfilled locally – a situation the government says is unsustainable. The government’s new treatment and recycling facility in Tuen Mun, scheduled for commissioning this year and operated by ALBA IWS, will have the capacity to handle 30,000 tonnes. The latest updates will be discussed at the Legislative Council environmental affairs panel next week. Draft legislative amendments will be tabled to the council for scrutiny in the second quarter, with implementation expected in the third. Hahn Chu Hon-keung, director of environmental advocacy at the Green Earth, welcomed the updates but believed the levy rates were still quite low and would have minimal impact on producers. Meanwhile, a report released on Sunday by United Nations University, the UN’s academic arm, found Hong Kong to have the highest e-waste per capita generation out of a dozen Asian countries, followed by Singapore and Taiwan. The report attributed the average increase in e-waste generation over the region – 63 per cent from 2010 to 2015 – to more gadgets and consumers and devices being replaced more frequently. Hong Kong and Singapore’s levels, it said, were particularly high because they did not yet have specific e-waste legislation. Both also had significant trans-boundary movements of e-waste generated domestically and in transit from other countries. “Increasing the burden on existing waste collection and treatment systems results in flows towards environmentally unsound recycling and disposal,” co-author Ruediger Kuehr said. An investigation by environmental group ¬Basel Action Network last year found Hong Kong to be a dumping ground for unwanted e-waste from the US . Under the new scheme, a permit will be required for the importing and exporting of regulated e- waste. Regulated e-waste will also no longer be accepted at landfills. The operator of Hong Kong’s first integrated recycling plant for electronics is hoping to increase the local recovery rate of such waste materials once its new facility and collection network become fully operational “on time and on budget” next year. Packed into yellow steel cages, stacked two storeys high in a Sheung Shui warehouse are 200 tonnes of old bulky television sets, inkjet printers, scanners and refrigerators that the government contractor has been collecting since July. It will reach full capacity at 600. The junk will be trucked off to the government’s first integrated treatment and recycling facility when it opens in the middle of next year at the Tuen Mun EcoPark – one of several measures to accommodate the government’s new “polluter pays” laws on certain types of electronic waste. The producer responsibility scheme will include televisions, fridges, washing machines, computer products and air-conditioning units. Passed in the legislature in March, once in effect, importers or distributors of the appliances will have to pay to help fund collection and disposal of waste electrical goods. “In Europe, recycling is something expected, but in Hong Kong we’re still learning,” said ALBA IWS director Nigel Mattravers, the government contractor tasked with building and operating the facility and network. The contractor is building five regional collection centres, including the one in Sheung Shui, to sort, store and record the e-waste, and eight satellite centres for collection only. Apart from helping businesses or NGOs conduct “take-back” services, the public can also drop e-waste off directly at the collection centres. About 70,000 tonnes of waste electrical and electronic equipment is disposed of in the city each year, 80 per cent of which is shipped off to regions such as Africa and Southeast Asia, while the rest is handled locally and dumped in a landfill. The new facility will be able to handle 30,000 tonnes per year but the operator claims it will be able to increase capacity by extending operating hours if necessary. “Much of this material is handled very badly across the world. At this facility we will recover all the hazardous materials from these appliances and make sure they are properly disposed of … and processed in a safe and environmentally sound fashion,” Mattravers said. The products will be detoxified, dismantled and turned into secondary raw material such as plastics, alumina, copper or iron, which can be reused for manufacture or landfilled locally “in a clean manner”. Mattravers said the target was to increase the local recovery rate to at least 80 per cent. The Environmental Protection Department said reliance on exports to manage e-waste was not sustainable in the long run because demand for second-hand products overseas would decline over time. Harmful materials found in e-waste, if not properly treated or disposed of, can harm the environment and human health. ALBA IWS logistics manager Lawrence Cheung said the operator would have strict guidelines on waste collection such as by collecting only from a registered retailer or licensed recycler to avoid collecting illegally imported e-waste. A two-year investigation by environmental group ¬Basel Action Network last year found Hong Kong to be a dumping ground for unwanted e-waste from the United States, in violation of the Basel Convention, which bars importation of hazardous waste. Medical waste, broken bottles and household trash are some of the items found in more than 100 tonnes of garbage salvaged near a drinking water reservoir in Shanghai. The suspected culprits are two ships that have been dumping waste upstream in the Yangtze river. It has then flowed downstream to the reservoir on Shanghai’s Chongming island which is also home to 700,000 people. The reservoir at the mouth of the river is one of the four main sources of drinking water for the country’s largest city, according to local media. China has struggled with air, soil and water pollution for years during its economic boom, with officials often protecting industry and silencing citizens that complain. China’s cities are often blanketed in toxic smog, while earlier this year more than 80% of water wells used by farms, factories and rural households was found to be unsafe for drinking because of pollution. Officials dispatched more than 40 workers to clean up the mess, but the area around the reservoir will take about two weeks to clear, the Shanghai Daily reported. Shanghai’s water authority claims supplies are still safe to drink, but has stopped the flow coming in while it continues testing, the paper said. Videos circulating on social media showed beaches and wetlands covered in a rainbow of plastic bags. “There’s enough trash to cover several football fields,” a local resident can be heard saying in one video. Catheter bags and used IV sacks are pulled from the water, and in some places only a sea of trash can be seen, completely obscuring the river water. “This is so sad, just humanity digging its own grave,” one commenter on Twitter-like Sina Weibo said. Needles and medical tubes were found in the trash, which has been washing ashore since 5 November. Despite cleanup efforts, a new wave of garbage inundated the island again this week. Earlier this year more than 500 students developed nosebleeds, rashes and illnesses, some as severe as leukaemia, in what local media linked to illegal toxic dumping by chemical factories. Although parents complained for months, local officials ignored their claims and disputed any connection despite levels of chlorobenzene, a highly toxic solvent that causes damage to the liver, kidney and nervous system, nearly 100,000 times above the safe limit. The country’s air pollution has been shown to contribute to more than 1 million deaths a year, linked to about a third of deaths in China’s major cities. The Environmental Protection Department (EPD) launched a joint departmental enforcement operation in mid-December with the Fire Services Department (FSD), the Police, the Planning Department (PlanD) and the Lands Department (LandsD) to inspect a number of open waste recycling sites in Yuen Long in the New Territories. During the inspections, three recycling sites were suspected to have illegally stored large amounts of chemical waste. The EPD is now investigating the persons involved and gathering evidence in preparation for instituting prosecutions. An EPD spokesman today (December 20) said that the joint operation conducted between December 7 and 16, entitled “Operation E-change”, aimed to conduct surprise inspections at open waste recycling yards in Yuen Long to check whether their operations complied with the legal requirements on pollution control, fire safety, land planning and use. During the joint operation, the EPD found that three recycling sites located at Lau Fau Shan and Shap Pat Heung in Yuen Long were involved in alleged illegal collection and storage of large quantities of chemical waste including waste LCD monitors, cathode ray tubes, printed circuits boards and lead-acid batteries for export sale. More than 1 300 LCD monitors and cathode ray tubes were seized during the operation. Some of the recycling sites were also involved in the dismantling of waste LCD monitors. In addition, the PlanD and the LandsD are also gathering evidence to check if the sites had breached regulations in land use and planning controls, as well as the land lease conditions. During the joint operation, the FSD reminded the person-in-charge and staff members of these recycling sites about the fire safety requirements. EPD staff also took water and soil samples in nearby areas to see whether the recycling site operations have affected the surrounding environment. The spokesman said, “General use and normal selling of LCD monitors, cathode ray tubes, printed circuits boards and batteries will not constitute danger. However, if a recycling site is involved in the collection, storage, dismantling, disposal or import and export of a large quantity of such waste, which contains heavy metals (such as mercury, cadmium and lead) as well as toxic organic compounds in such form, quantity or concentration so as to cause pollution or constitute a danger to health, it is regulated under the Waste Disposal Ordinance and the Waste Disposal (Chemical Waste) (General) Regulation. Improper treatment of chemical waste will cause pollution of the environment and affect public health. Any person who collects, stores, disposes of, imports or exports chemical waste must apply for a licence or permit from the EPD. However, the three recycling sites concerned have not obtained the required approval. The EPD reminds waste recycling site operators that if their sites involve handling of hazardous electronic waste under the control of chemical waste regulations, they should register with the EPD in accordance with the law. Chemical waste must be properly packed, labelled, stored and collected by licensed chemical waste collectors for delivery to the EPD’s licensed chemical waste treatment facilities for disposal, otherwise it will constitute an offence. First-time offenders are liable to a maximum fine of $200,000 and six months’ imprisonment. The EPD and relevant departments will continue to conduct joint enforcement action to combat illegal activities at waste recycling sites.